The headline numbers for May suggested reason for optimism — employers added 431,000 jobs and the jobless rate fell to 9.7 percent, from 9.9 percent in April. But the underlying numbers showed that almost all of the growth came from the 411,000 workers hired by the federal government to help with the Census. Most of those jobs will end in a few months. Now, I'm not sure exactly what numbers are being used here. The news reports focus on seasonally adjusted establishment survey numbers. The increase of 431,000 is in seasonally adjusted payroll employment from March to April. However, I'm not sure whether the 411,000 workers hired to do the census is a raw number or a seasonally adjusted number, or whether it is coming directly from the federal government or from the establishment survey. 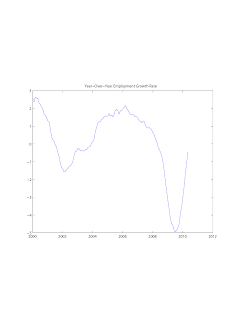 Indeed, in the seasonally unadjusted data, the change in federal employment from March to April was (guess what?) 411,000. If we look at the unadjusted data, the total gain in employment from March to April is 1,090,000, of which 711,000 is coming from the private sector and 379,000 from the government. This is now beginning to look somewhat better for the private sector, but of course private sector employment tends to grow at a high rate in the spring, coming off its low point in January. It's clearly important to account for seasonal variation in some manner. However, let's forget the above numbers for the time being and focus on year-over-year percentage changes in establishment survey employment, and see what that tells us. I have provided the chart. Now, I don't see any reason for pessimism in this picture. 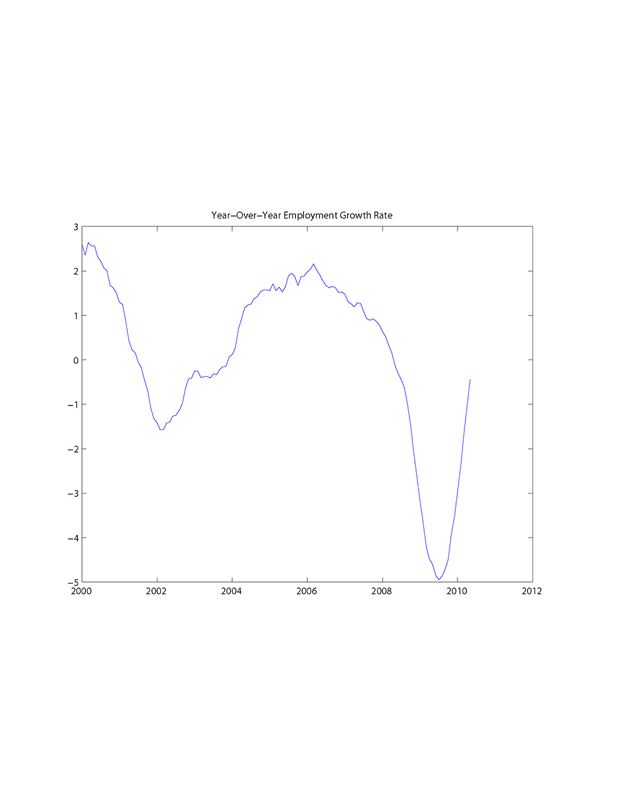 Year-over-year employment growth is increasing at a very rapid rate currently, and there is a lot more strength than was the case after the last recession. While government employment has increased 3.3% (April 2009 to April 2010), government employment is currently 17.8% of the total, so most of the strength in the employment picture is coming from the private sector.